Learn Welsh with 200 Words a Day! Snapshot Welsh words directly to your memory using cartoons. The Welsh word for dress is ffrog. that is a FROG in a FROCK. 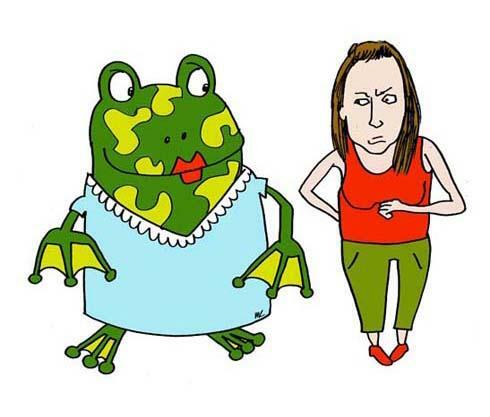 To make it even easier for you still, we give you a zany cartoon to help remember the picture of the frog in the Frock or dress. Notice also that in the pic the frog is a female character - Coronation Street actress Joanne FROGG-att. She is there for a reason . . . a powerful reason. Being a female this reminds you the Welsh word for dress, ffrog is a feminine word! You'll Superlearn every Welsh word with a picture! It's like .... lightning fast! Yes, you can speed up your Welsh language and Welsh vocabulary acquisition, in the comfort of your home, using the modern PC based techniques, developed from the teachings of the world's Memory Masters. You learn 3 to 5 times faster than using traditional, (... and boring) language learning techniques. Every one of the words you learn has a zany cartoon to remind you of the word, AND its gender (masculine or feminine)... an important concept in Welsh. "I have never seen a language product so addicting, effective and creatively very well done! I even dream of the cartoons in my sleep!" Now available from the Excelerated Learning team at Exceltra is Learn Welsh 200 Words a Day! Course #1. We've teamed up with the 'Learn Welsh' experts at Popeth Cymraeg in Denbigh, North Wales, where they have taught Welsh to thousands of students over many years. Using our innovative and award-winning techniques, combined with their Welsh linguistic expertise we've come up with the most effective Welsh language and vocabulary builder yet devised. It combines dozens of innovations and accelerated learning tools, including combining word association, animation, visualisation, simple yet effective memory techniques, linkword techniques, Lozanov's techniques, superlearning methodologies, alpha brainwave induction, rythmic breathing and loads more! • Over 70 Welsh lessons on the Learn Welsh CD-Rom, and each is just 3 - 10 minutes' duration, after which you can immediately test your progress and see how quickly you are learning Welsh words and phrases. • Watch your Welsh learning rate with pride and astonishment! (... it is automatically calculated in 'words-per-day'. If you are not pleasantly surprised at how quickly you can learn Welsh basics, and how quickly you can build a solid foundation in Welsh, you can even get your money back! Superlearn Welsh - it has never been easier to get a grasp of Welsh words and basic Welsh grammar. • Each word is spoken by Welsh nationals giving you the correct pronunciation to listen to, and copy, as you learn Welsh. • You never need forget another gender as you learn Welsh! Our main character in the cartoon will remind you of the word being feminine! • The best Welsh course available giving you a fun, picture cartoon for every single Welsh word, phrase and common expression in the 'Learn Welsh 200 Words a Day!' course. This means you will remember the picture, so you can more easily remember the Welsh word, given that 'a picture paints a thousand words...'. Remember this - your brain never forgets a picture. Every picture you have ever seen, every image, is recorded in your brain. When you get stuck for a Welsh word, you just relax and think of the picture. As you think your brain starts hunting around all the billions of brain cells for some Memory Triggers. The more Memory Triggers it has, the clearer the pic, the easier the recall. Try another one. . .
... imagine on a man's HEAD is a large PEN. 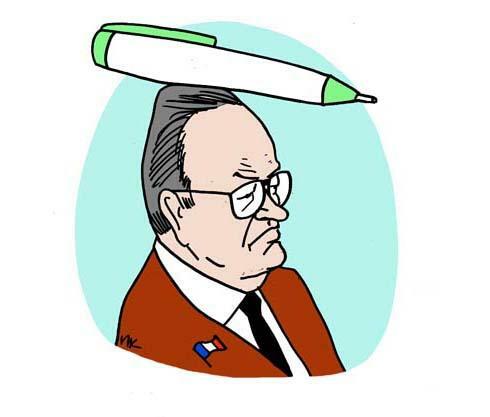 Now imagine that he is French politician Jean-Marie Le PEN, and you'll never forget it's a masculine word. Learn Welsh 200 Words a Day! You can see how easy it is to learn Welsh at 200 words (and more) a day using these easy memory friendly and brain-friendly techniques. This system steps ahead of the rest for speedier and more effective Welsh learning, giving you all the most commonly used Welsh words and phrases. Yes, in the Rapid Mode you can even have fifty to a hundred Welsh words an hour being presented to you, which is ideal for previewing, revising and summarising as you learn Welsh with our 200 Words a Day CD-Roms. with 800 Welsh words a person has the basics for operational communication with a Welsh language speaker. You can see what an effective language learning tool you will have in your hands. Course 1 of Learn Welsh 200 Words a Day! teaches you over 1000 words including the 100 most common Welsh words. • Suit your learning style. What else is hot about these 'Learn Welsh 200 Words a Day' language courses that make them so great for someone wanting to quickly learn Welsh? for you to learn in every Welsh course. • fun, bright, fun, easy, colorful. Just relax and bring your sense of humour! with lots of useful & easy functions to select from for accelerated your Welsh language learning. Learn Welsh fast! each member of your family can learn Welsh at his or her own pace. Each person's progress is individually recorded in their own private database log. You can even hold competitions with one another, to see who does learn Welsh words the quickest! Optimal learning involves revising and reviewing your work. With most learning systems, it's easy to forget about revising, but not with our system. You will be prompted by the 200 Words a Day Learn Welsh programme to revise and re-test yourself a day after you complete any lesson. Then again it reminds you to revise that same lesson after a week, then after a month, then three months, then after a year. continuously keeps you updated on your progress. right click on the screen any time when you need assistance. This means help is always just a mouse-click away. This makes it easy and convenient. • A range of over 70 Welsh lessons! Up to 30 words in each Welsh lesson covering topics such as Food, Counting, Welsh Greetings, the Months in Welsh, weeks and days of the year in Welsh, Family, Town, Travel, Welsh Verbs, Common Welsh Expressions and Home & lots more. • Blitz, bludgeon and batter your worst words as you learn Welsh! This 30 word Welsh lesson is one you should constantly revisit, and review, as it allows you to focus on the your problem Welsh words. The ones you get wrong the most often. You can now cudgel these and bludgeon them in to submission! The programme's ground-breaking software is constantly calculating and assessing your scores for each and every time you take a test on any word. The best and worst are ranked accordingly with your performance as you learn Welsh vocabulary, expressions and phrases. To get yours now use the ORDER FORM BELOW NOW and your Learn Welsh 200 Words a Day CD-Rom will be on its way in no time. YES, ORDER HERE NOW, Learn Welsh 200 Words a Day! Yes, ORDER your 200 Words a Day! Learn Welsh CD-Roms HERE. Just click below NOW! Turbo-blast & supercharge your Welsh learning with this 'Learn Welsh CD-Rom course! Individual Memory Triggers © help you learn Welsh words & Welsh phrases quick, fast. Cartoon pictures for each & every Welsh word and phrase! including loads of animations. Test & retest your Welsh vocabulary as you learn Welsh. Your Welsh Learning Rate is calculated constantly on a 'words-a-day' basis after each and every Welsh lesson and Welsh test. Blitz and bludgeon your Worst Welsh Words! Three Gender Triggers© for each and every Welsh noun. Never forget a noun's gender when you learn Welsh. Native Welsh speakers for perfect Welsh pronunciation help you learn Welsh. Easy & fun for six Welsh learners - all with their own private notes & passwords. Fun for the whole household. 100 most common Welsh words used in 50% of Welsh conversation. Lots of important common Welsh phrases and expressions. Over 70 Welsh lessons Food, Counting in Welsh, Family, Town, Travel, learn Welsh Verbs, Common Welsh Expressions, Home & lots more. All learning styles for Multi-Modal Welsh learning. Tools for Kinaesthetic learning, Audio learning styles, Visual learning styles. Build your own Welsh lessons too! Easy on-screen help with a right-click of the mouse. Please select either US$ or UK£ currency. US$4.95 / UK£2.50 postage added to CD-Rom orders. For Apple Macintosh users: To run your 200 Words a Day! programme, you need a Windows Emulator program installed on your Mac. e.g. PC Emulators for Mac OS X on PowerPC G3, G4 and G5 or PC Emulators (virtual machines) for Mac OS X on Intel-based Macs. We accept direct credit/debit card payments by phone. Or, leave a message with your contact details and preferable local time to call. We will endeavour to return your call as soon as we can. Exceltra, 32 Alverton, Milton Keynes, MK14 5EF, United Kingdom. P.S. Remember I personally guarantee for 365 days we will refund your payment for our CD-Rom should it not meet your expectations in any way. P.P.S. If your time is valuable to you, and you like to use it most effectively, then try our cutting-edge language learning software. Learn Welsh rapidly and remember it. P.P.P.S If there is a more effective system out there, please do let us know. Exceltra makes Accelerated Learning easy and fun.